This is a pin from Tokyo Disney Sea, a Theme Park at Tokyo Disneyland Resort in Japan. 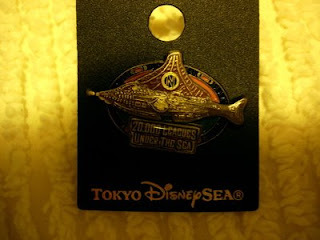 This pin features the Nautilus, seen in the Disney film, "20,000 Leagues Under the Sea", and is a walk-through attraction at the Tokyo Disney Sea Theme Park. This is an interesting pin, and I would part with it for $25.